We’re Clayman Supplies – a family-run, experienced and competitively priced pottery supplier based in Chichester, West Sussex. With over 43 years' experience of supplying materials and equipment to hobby, craft and semi-industrial potters, as well as educational institutions and craft retailers, we have the product range and know-how to meet your requirements. Whether you’re looking for clay, glazes, tools, wheels, kilns or something else, you'll find it at Clayman – and if it’s not in stock, we’ll let you know when it will be. Since 1978, we’ve built our reputation as one of the UK’s leading pottery suppliers. You don’t need to take our word for it – the facts speak for themselves. Clayman’s story can be traced back to 1978, when our Director, Reg, set up shop in Nyetimber, West Sussex, operating as Nyetimber Pottery Supplies. 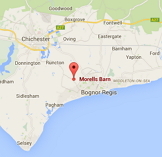 In 1995, we moved our shop onto the same site as our mass storage at Morrells Barn in nearby Lagness. A fine example of a single isle, five bay Sussex barn, Morrells Barn dates from the 18th century and is surprisingly well preserved. These days, we remain a family-run business, with Reg and Linda continuing to work in our shop and attached office – although the advent of the internet has changed how many of our customers shop with us. We’re open Tuesday to Friday, 9.30am to 4.30pm, and Saturday, 9.30am to 12pm. Whether you’re planning a trip to see us or you prefer to order online, we value every single one of our customers and look forward to meeting you.